Submitted photo Kayley Gimbel announced Tuesday that she will be accepting a scholarship to the University of Findlay to attend school and be a member of the women’s tennis program next fall. Joining Gimbel (seated, middle) for the announcement were: Seated (L to R)- Father Erik Gimbel and Mother Angela Gimbel and Standing- Coach Terry Gribble and Grandfather Ken Barker. GALION — To say that the Galion Lady Tigers tennis program has made a solid run over the last few seasons would be an understatement. After a perfect, 20-0 overall season in 2017, which included a 12-0 mark within the Mid-Ohio Athletic Conference, the expectations for the Lady Tigers were high in 2018. Galion would not disappoint as they would post another perfect season, this time at 23-0 overall and 14-0 in the MOAC en route to their second consecutive conference tournament championship. When all was said and done, the Tigers ended the 2018 campaign on a 47-match winning streak reaching back to the tail-end of the 2016 season. A big key to the success of the program was first singles standout Kayley Gimbel. 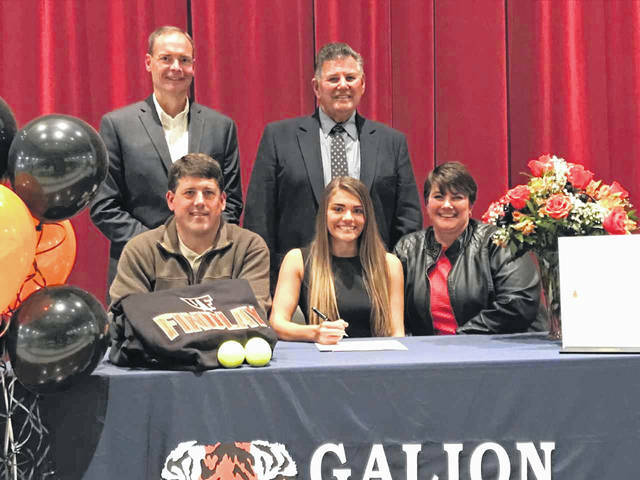 Throughout her time on the tennis courts representing Galion High School, Gimbel played her way to four varsity letters while earning first-team, all-conference honors in both 2017 and 2018 and netting second-team accolades in 2016 as a sophomore. In addition, Kayley won the MOAC title in 2018 over her nemesis, Maggie Pitts from Harding. Pitts defeated Gimbel to claim the MOAC title at first singles in ‘17. Over her four-year career she amassed a total of 95 wins, 83 of which came playing in the first singles position. Additionally, she is a three time district qualifier, earning first-team all-district twice. Gimbel would closeout her career in ‘18 with a sectional championship, a district runner-up honor and with her second consecutive trip to the state championships at Lindner Family Tennis Center in Mason all while also earning another All-County All-Star selection. But where would Gimbel go from there? At the National Honor Society induction ceremony on Tuesday evening, Gimbel answered that question. Although nothing was officially signed at the event, the announcement was made that Kayley would be attending the University of Findlay in the fall of 2019, as well as joining their tennis program. On Wednesday, Gimbel would make it official by signing and returning her letter of intent to the school. Kayley has been offered and accepted an athletic scholarship to play tennis at the University of Findlay, a NCAA Division II school next fall. The Oilers are members of the Great Midwest Athletic Conference (G-MAC) and are currently the largest school, enrollment wise, in the conference. Gimbel said in an email, “The University of Findlay is a perfect fit because I can take advantage of my college credit plus classes earned through the sci-med program at North Central State College as I work toward my doctorate in physical therapy. I can also play tennis close to home so my family can continue to come and watch and support me”. https://www.galioninquirer.com/wp-content/uploads/sites/38/2018/11/web1_Gimbel-an-Oiler.jpgSubmitted photo Kayley Gimbel announced Tuesday that she will be accepting a scholarship to the University of Findlay to attend school and be a member of the women’s tennis program next fall. Joining Gimbel (seated, middle) for the announcement were: Seated (L to R)- Father Erik Gimbel and Mother Angela Gimbel and Standing- Coach Terry Gribble and Grandfather Ken Barker.